This laundry & bathroom area is the most difficult to describe for me because we moved a few walls around. There were only two film photos in the album the former owner gave us, but after chatting with the original owner's sister, it sounds like this is basically what it looked like in 1959/1960 when the home was complete. I also heard it was the first room done, since the family was living in the garage while they completed the interior of the house - they lived here without a working bathroom (and an outhouse from what I hear...) for a year or two. This is the original laundry room - round, bubble tile to the ceiling in peach/mauve/goldenrod yellow of all sorts of sizes. We actually uncovered some of this - albeit painted blue - when we took out this room to make way for the hall bath. A door to the exterior of the home, which was not visible when we closed on the house. The cabinets here were metal, and I LOVED the knobs. This is what it looked like the day we closed on the house. 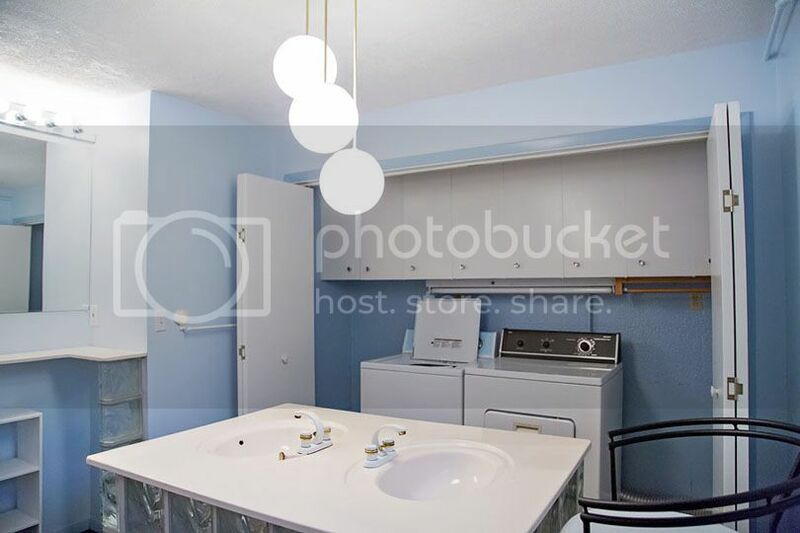 This is from a different angle, of course, but the washer/dryer and cabinets are sitting in the same spot as the top photo. You can sort of tell that the tile is still on the walls - just painted periwinkle blue. And here's what it looked like after we had new walls framed in, the tub installed, and the washer & dryer moved onto the other side of the wall (to the left, into the garage, which we made an interior room). 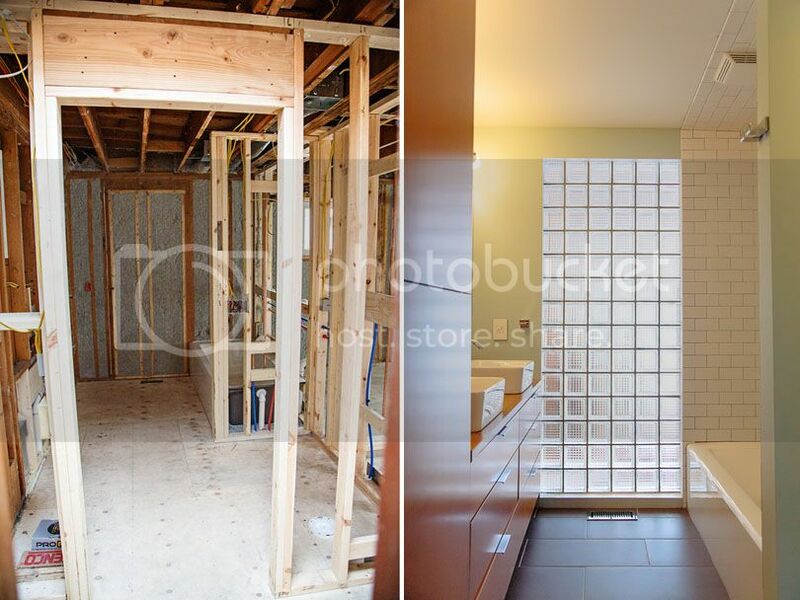 On the right is what it looks like today; because there was no window, we decided to turn the old exterior door (which was apparent in the brickwork outside) into a glass block wall. The bathroom & laundry room were originally separate. 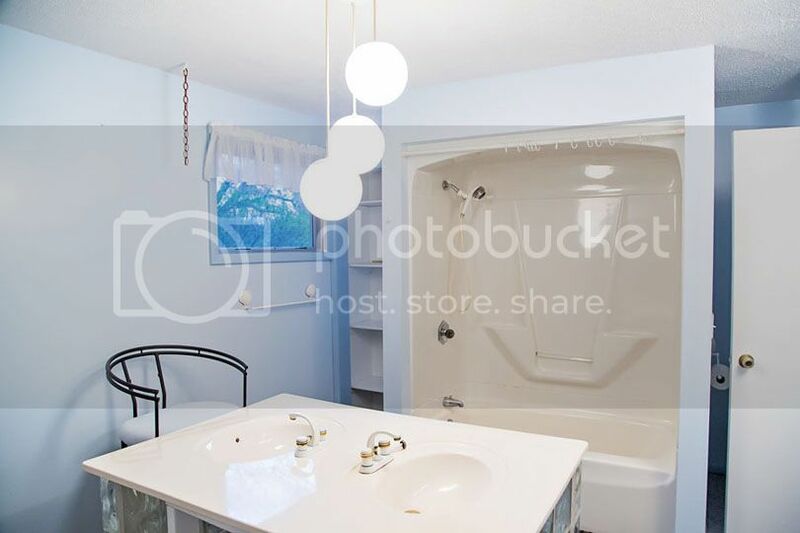 The original owner's sister said this was a "wild" bathroom. She was in awe of the bubble tile - she personally didn't like it, and wondered where in the WORLD you'd get round tile, when "everyone else had 4" square tiles" in their bathrooms. 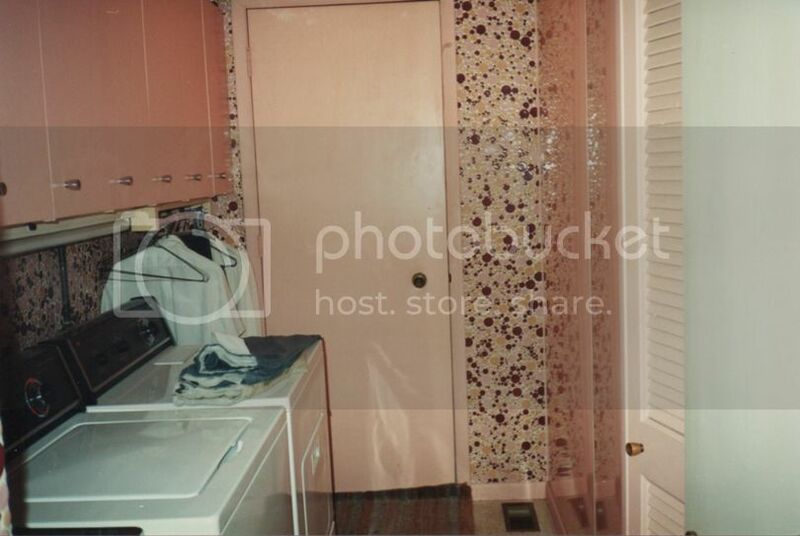 Can we talk about the magenta countertops with double vanity and chrome-rimmed sinks for a second? WOW - love it! And it looks like there was a little storage area right above the sinks and under the mirror - maybe a mini medicine cabinet? The wallpaper! The drapes! That pendant is interesting - doesn't look too "modern" to me, but the lighting here wasn't super modern (from photos). There was a separate tub (as seen in the reflection of the mirror) and a standing shower. 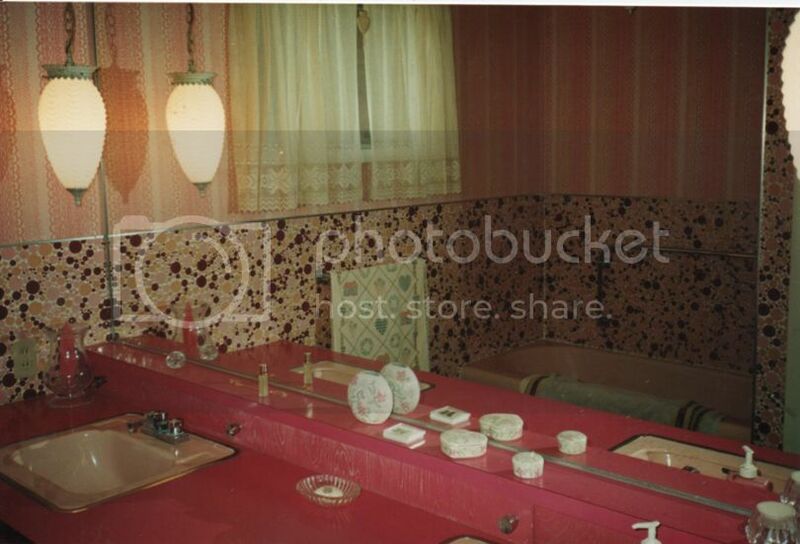 I don't have photos of the toilet & shower, but I'd assume it was Mamie pink like the tub & sink. Here is what this room looked like when we closed. 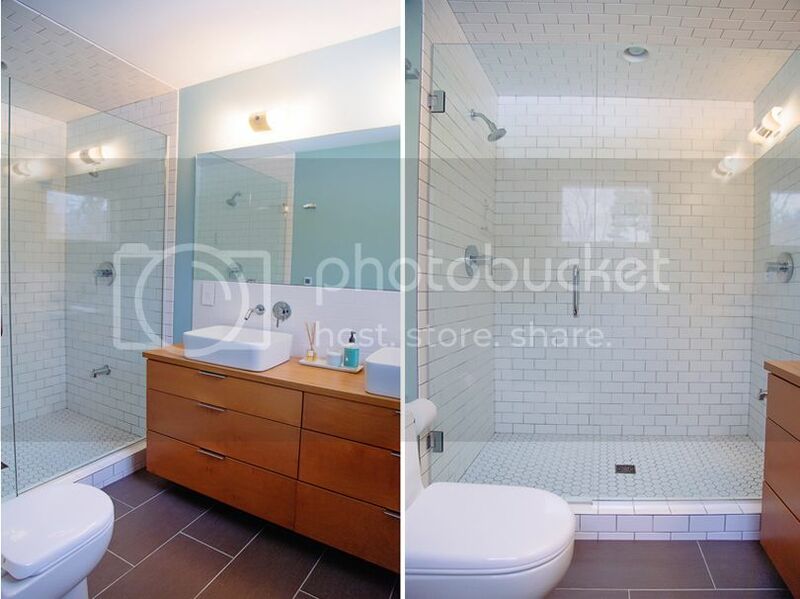 The window is in the same spot, and I'd guess the double vanity is where the tub/shower is in this photo. The island double-facing sink that the previous homeowner put in was hilarious to us - and was the first thing we took out. This is looking into that area from our bedroom. 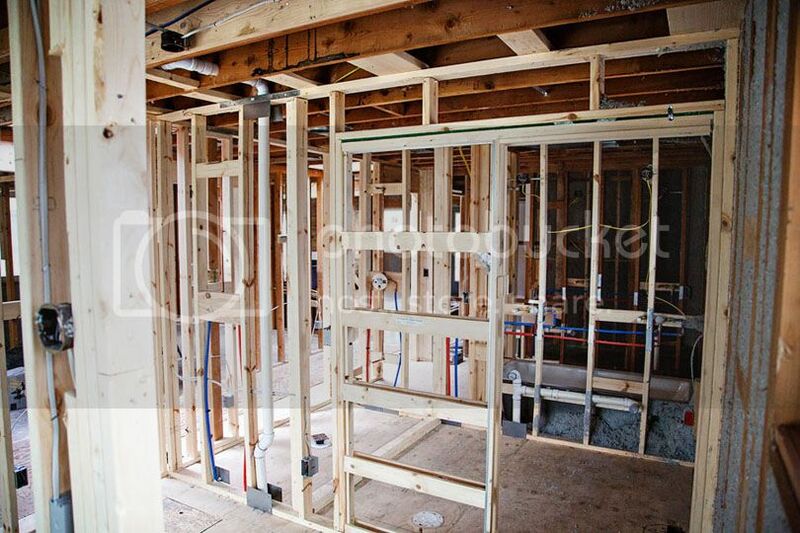 We opened it up to the master bedroom & closet, and you can see the left side of the room is plumbed for the shower. I think the toilet was always in that spot, based on the plumbing we took out of there when the floors were out. Today it's looking a lot more modern. We went with a simple white subway tile (grouted in gray in the shower, and white on the backsplash). The window is in the same spot, and the toilet isn't far from where it originally sat. 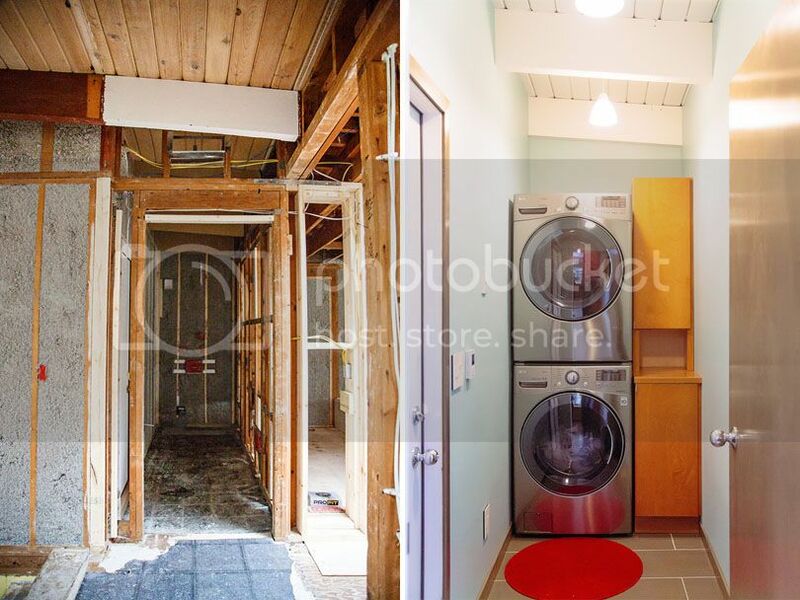 Since we made the original laundry room into a second bathroom, we needed to find a spot for our washer & dryer. Instead of putting them in the basement, we bumped out the garage wall out a bit, and put in a 48" wide room to stack our full size washer & dryer. This also acts as a drop-all spot when we come in from the garage - which means this room is trashed most of the time! Since this photo was taken, we've added hooks & some prints to the walls to make it a bit more "lived-in".